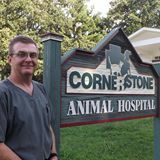 Cornerstone Animal Hospital was established in 1998. Dr. Marty Turner had a vision to open a Christ honoring clinic, while providing the highest standard of veterinary care for our patients. We encourage making appointments to allow ample time with shorter waits for our clients. We do take walk-in and will do our best to get you seen in a timely manner. Emergency cases shall always receive top priority. We also offer drop-off appointments for your convenience. You can leave your pet with us for the day or just a few hours. There is not any additional charge for this service but we do require your pet to be up to date on all vaccinations. Please bring your pets in on a leash or in a pet carrier, to insure the safest possible environment for you and your pet. Payment is expected when services are rendered. We do not do billing in order to focus on our patients' needs and minimize cost. We accept debit cards, credit cards (Visa, MasterCard, Discover, American Express) Apple pay and Android pay, CareCredit, cash and checks. When unexpected illness or accidents occur we do offer and accept, CareCredit. We have a link on our home page and paper application in clinic. It takes about 5 minutes to process an application in clinic. Once approved we can break down your payment into 6 monthly installments, and as long as monthly payment are made on time and full balance is paid within 6 months it is interest free. This is no annual fee with this card. We also have information for popular pet insurance.